Madrid-based design professionals, Tarimas De Autor, have a real treat in store today for us! 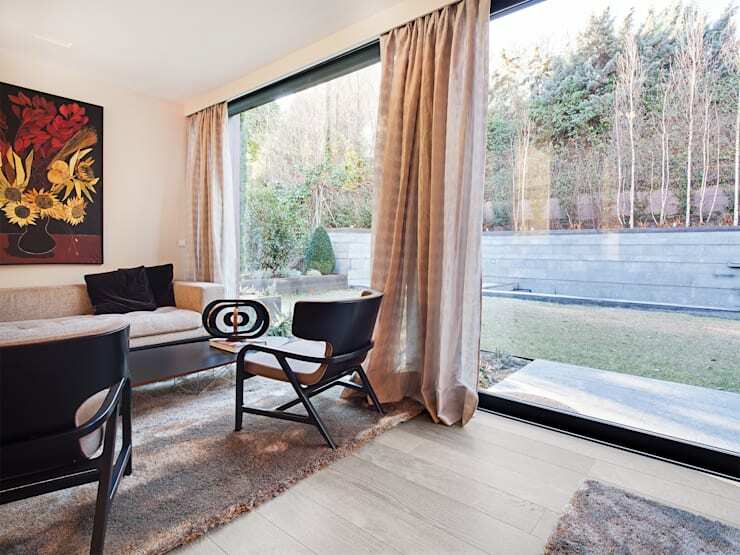 They've designed a modern and magnificent family home that is as stylish as it is functional. As we explore each room, we will see how natural light and soft tones create a very cosy and warm interior, while each detail included in this space has been carefully chosen to create the overall look and feel. In this home, you will see how it's the little things that contribute to bigger picture! 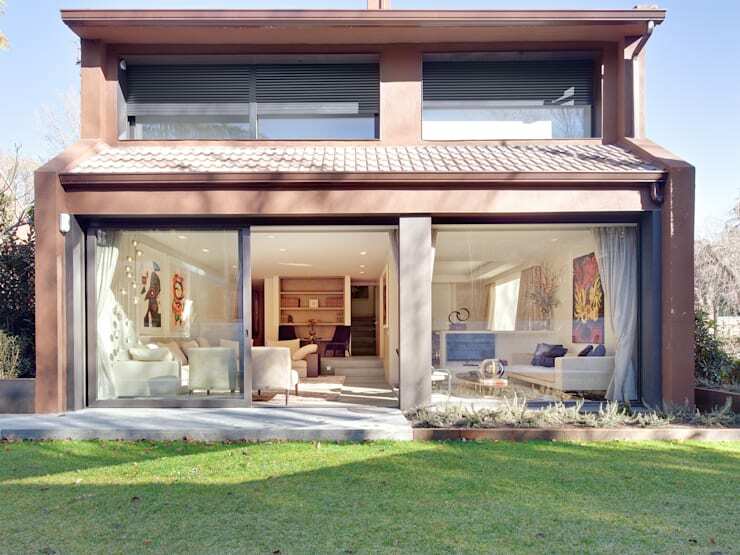 In this image, we can see how the double-storey home is subtle yet magnificent. The facade features soft brown tones, with the bottom floor made up nearly entirely of glass. This allows the interior living space of the home to flow out onto the exterior space, visually and physically expanding it. Don't you love the wonderful interaction between spaces in this design, keeping the interior of the home open, light and bright? If we have a look at the living room, we can see what a strong role natural light plays in the home. 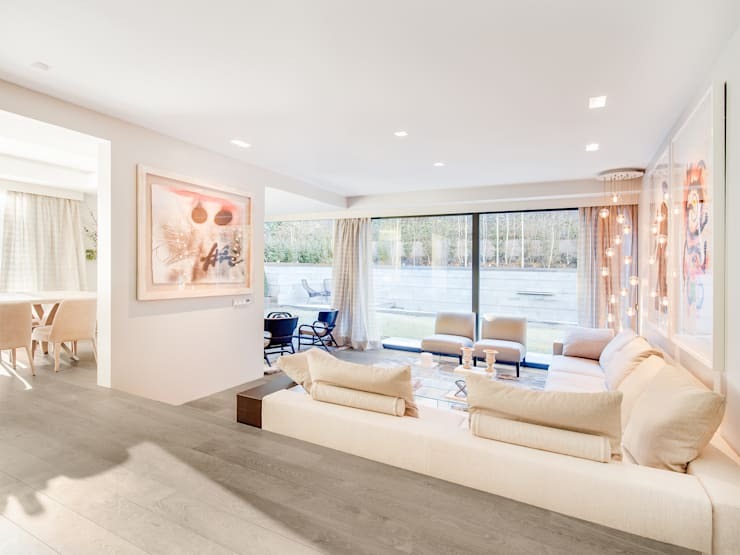 The large glass windows and doors allow fresh air and sunshine to flow through the home, opening the space up and making for a very appealing interior design. The designers have chosen soft colours for the living room, including light wooden floors, cream sofas and soft pastels in the form of cushions and artwork. This enhances the natural light, reflecting it so that the home is even more bright. The designers have also picked out soft little dimming lights for the living room, which create ambiance and romance throughout the space. This gives the room a beautiful glow! In this image, we can see how a plush rug and chocolate brown touches here and there break up the soft tones, resulting in a very appealing interior design. A family home should look stylish and sophisticated, but it should also be comfortable and functional. Thus the designers have chosen to feature elements throughout this space that are both beautiful and functional. The large, plump cushions, for example, provide the room with trend as well as a cosy space to cuddle up with a good book. The soft curtains frame the windows, but also allow the natural light to be filtered in. Part of having a functional home is to make the most of the space available to you. This is exactly what the designers have done in the attic of this home, converting it into a more casual family room or living room. As we can see in the image, they've worked with the sloped ceiling, installing skylights so that this room doesn't become too dark and dingy. They've also added decor elements that introduce a bit of colour and personality to this space. Remember that your home is an extension of who you are so you can have a little bit of fun with it. Add a colourful vase or cushion to a space that you've picked up on your travels or include family photographs in your home design. These details will bring charming splashes of life to a house. 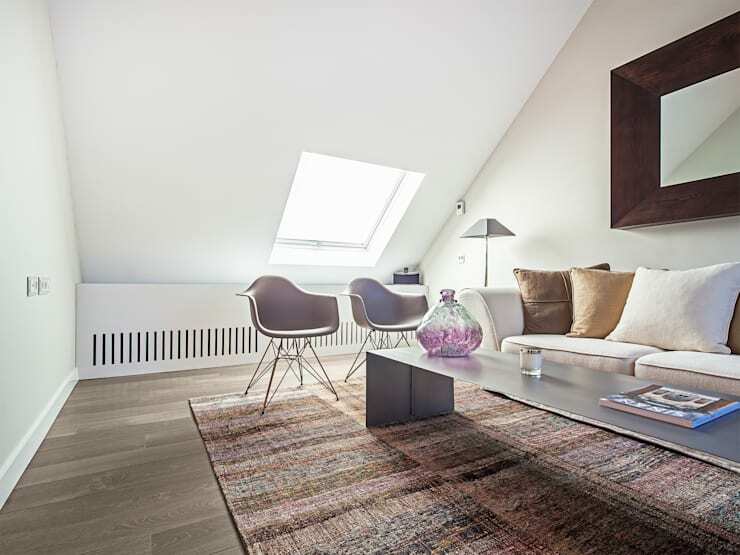 If you love the look and feel of this room, have a look at these: Top tips for your attic space. Soft colours have been chosen for the bedroom, creating a peaceful haven where a person can relax and regroup after a long day. The pale walls, soft and light linen and sandy-toned rug all contribute to this tranquil look and feel. Lighting also plays a big role in this space. The natural light streams through the windows, while the lamps offer a soft glow in the evening. You'll also notice that there aren't too many personal items littering this space. Everything that is featured has been carefully chosen to enhance the room in its entirety. Storage units such as shelves and a chest of drawers keep all personal items stored neatly out of sight—a great design trick! 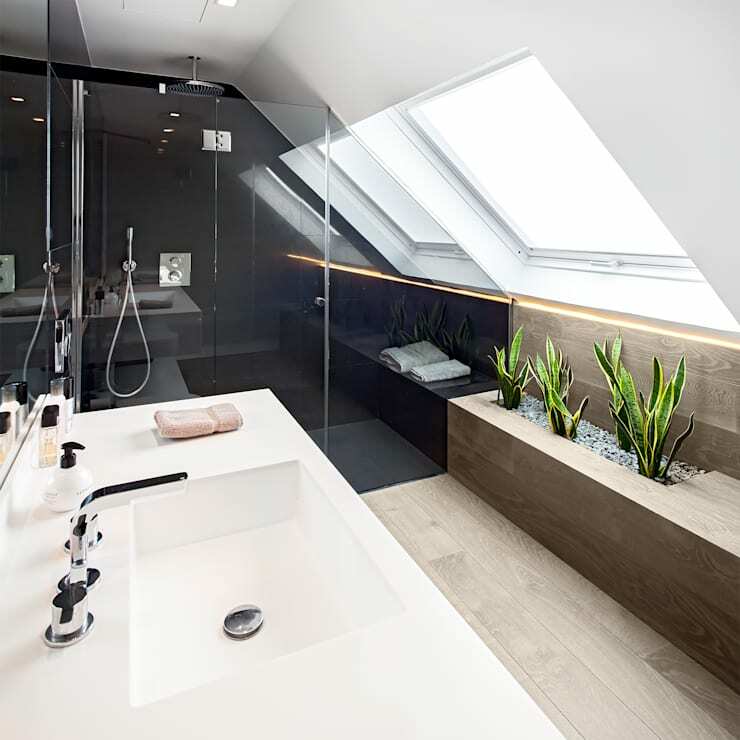 The bathroom is one of the savviest spaces in the house, thanks to the neutral colours and the introduction of greenery. Bathrooms are often overlooked in designs, but they shouldn't be! Your bathroom is one of the rooms in your house where you spend the most time. This is a room where there should be great care taken in creating a zen-like space that will get you prepared for any day. As we can see in this image, adding pot plants or even a little garden bed to a room like this can breathe new life into it, making for a very trendy, warm and inviting design. 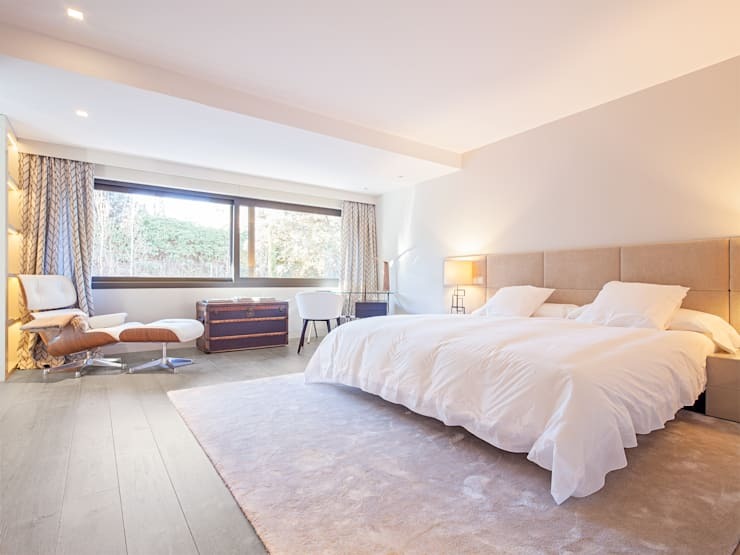 We end off our tour back where we started, as we want to show you how the designers have used tiled flooring to extend the wooden flooring from the inside of the home to the outside of the home. This creates an outdoor terrace space, which can be used for dining under the stars or enjoying a cup of tea on a comfortable chair. It also means that the family aren't cramped up inside the house. 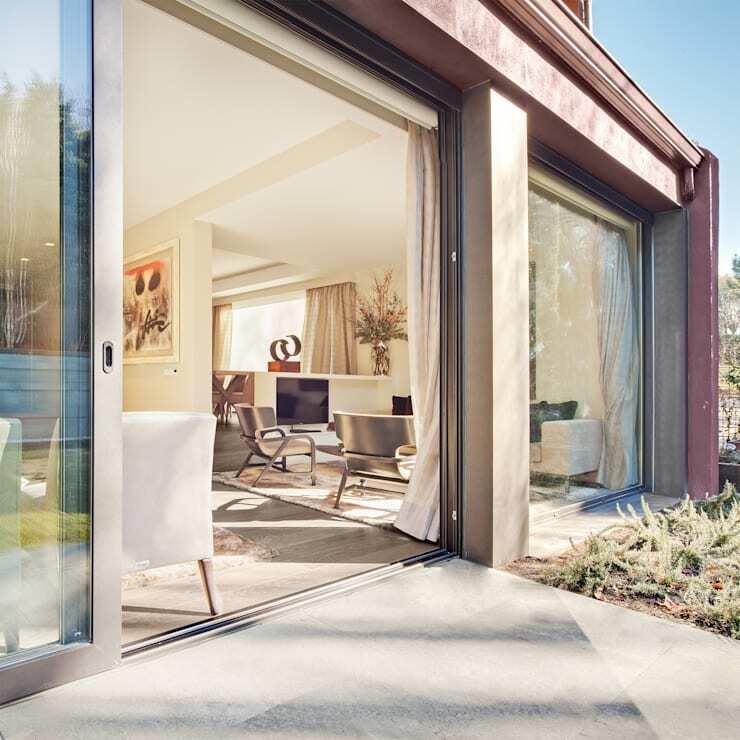 This image also shows us how easy it is to create a transition between the interior and exterior spaces, by utilizing glass doors that slide back like these ones. Very functional and trendy!